This mound, about 850 meters (2,789 feet) south of Monks Mound, was not included on the Patrick Map. Patrick numbers 71 mounds, which he includes in the main portion of his map of the Cahokia site. The first map Moorehead published (1922) appears to be a very close copy of the Patrick Map. However, in his second publication (1923), he includes a very crude sketch obviously based upon the Patrick Map but with confused numbering of several mounds. On this one, the first map on which Mound 72 appears, he numbers it 77, and the number 72 he applies to the mound that Patrick numbers 53. In 1929, in his final publication on the Cahokia site, Moorehead returns to the numbering that Patrick used, assigning the number 72 to the mound discussed here. The UWM Map retains this number since it represents Moorehead’s final publication correcting errors of numbering on his previous map. Mound 72 is a small, ridge-topped mound that appears on the McAdams Map of 1882 with a height of 10 feet (3.05 meters) and on the Peterson-McAdams Map of 1906 with a height of 8 feet (2.4 meters). Using the 127-meter (416.7-foot) contour as a base, the UWM Map shows a height of 1.8 meters (5.9 feet). 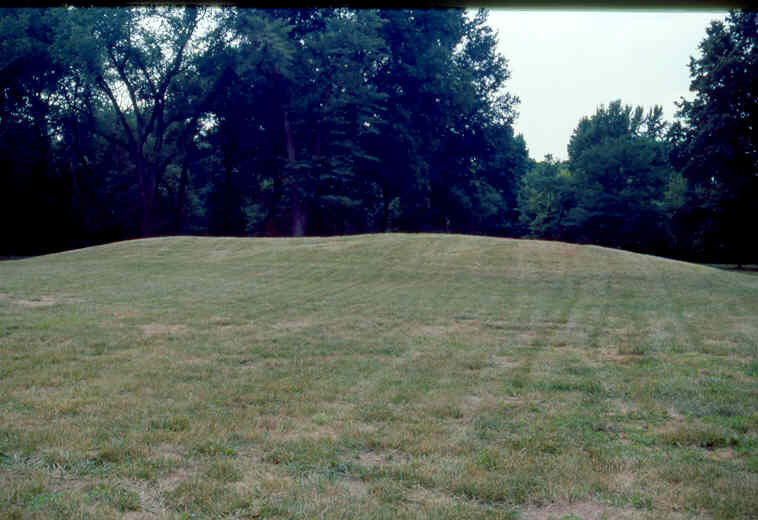 The mound is oriented differently than most mounds at the Cahokia site in that its long axis is on a northwest-southeast orientation approximately 30° north of east. The lenghth of this mound calculated on the basis of the 127-meter contour line is 42.6 meters (139.8 feet) and its narrow dimension is 21.9 meters (71.8 feet). 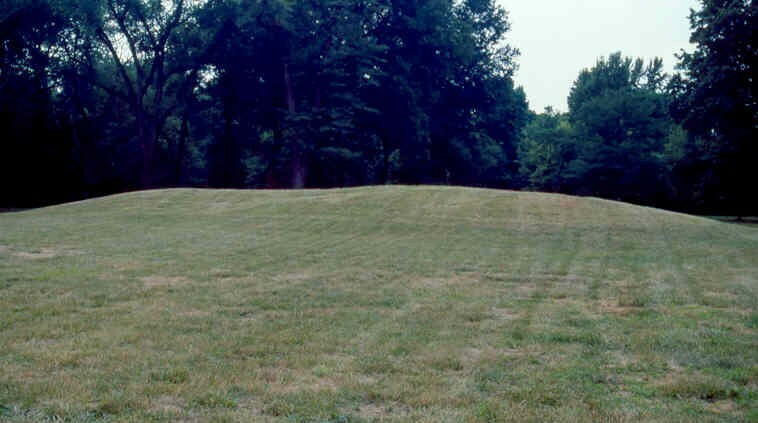 Because of its orientation and some ideas about the nature of ridge-top mounds at the Cahokia site, this mound was excavated between 1967 and 1971 by crews from the University of Wisconsin-Milwaukee. In the southeast corner of Mound 72 were indications that a large post had been placed in the ground. The post was later removed but the pit into which it had been placed remained, and impressions of the log were found in the base of the pit. Supporting this log in the bottom of the pit had been two or more smaller logs, which were partially preserved. Radiocarbon dates on these logs give a date of approximately A.D. 950 for the time when the post was placed in the ground. Excavations through the mound indicated that it had been constructed as a series of smaller mounds that were then reshaped and covered over to give the mound its final shape. Within these smaller mounds a series of features was excavated, mainly burial pits and burial deposits. More than 250 skeletons were recovered in various states of preservation. One burial seemed to be an individual of great importance; he was buried with the remains of other individuals on what appeared to be a platform of shell beads. Near him were several retainers with grave goods accompanying them. Among these grave goods were several hundred arrowheads of very fine workmanship, separated into distinct categories. Among the categories were shapes and materials indicating relationships between Cahokia and areas as far away as Oklahoma, Tennessee, southern Illinois, and Wisconsin. Most of the burials and grave goods accompanying them suggest that many of the people buried in this mound were sacrificed, probably to accompany one or more important individuals. Data recovered from this mound indicate that distinct social stratification was present at the Cahokia site, and extensive economic relationships existed between Cahokia and widely separated areas of the middle portion of North America (Fowler 1969, 1972).